Best fundraising ideas for Schools, Sports Teams, Churches, Non Profits, and Individuals that need to raise money. Fund the tools to help you and your students raise the bar in education. they need for the right equipment. mission trips or church projects. Support your cause and organize supporters to help fund your group. goal at the same time. Sell the highest quality products to friends and family with no cost upfront. local business and you at the same time. and highly profitable custom fundraiser. take donations online for your cause. Fast Track Fundraising has been helping with fundraisers for schools, non profits, sports and church groups for more than 10 years. Over that time period we’ve helped groups raise more than $50,000,000. So we’ve obviously learned a thing or two about which fundraisers work and which don’t. So let us help you. Lots of things have been changing in fundraising. Did you know that rising chocolate and beef prices has completely changed candy fundraising? Major manufacturers like Hershey's and Mar's have either left industry or have priced themselves out of the market. The same is true with many beef products. With beef at record prices beef based products have begun to shrink just like candy bars have. Of course there are still good choices if you want a candy fundraiser. We believe that every group should be able to raise the money they need without a lot of stress or grief. We want to help from the moment you start looking for the best fundraiser and continue helping to making sure you’ve made the highest profits when you’re done. We firmly believe that the most important step is choosing the best fundraiser so we’ve designed our site to help you do that. At the top of the page you will see links to sections showing the top fundraisers by group type. We really suggest you start with this resource because it will show you which products have been working for your group type. If there are specific fundraising products you are interested in, we also have overview sections designed to offer in depth information by product group. If you want to talk to one of our fundraising advisors call us toll free 1-888-778-2580. 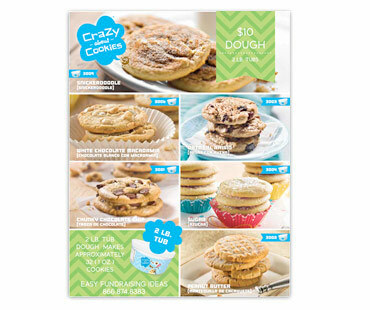 Cookie dough has been one of the top fundraiser products for years. This no upfront program is perfect for medium to large groups. Our new $10 price point has group after group reporting record cookie dough sales. Sell discount cards that supporters love and will buy year after year. Choose and sign up your own merchants for the highest possible profits anywhere. 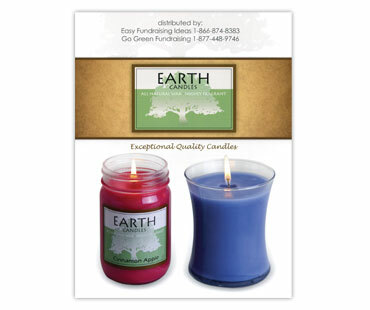 Earth candles have been our top candle fundraiser for the past 4 years. If you are looking for a fundraiser that has no upfront cost and offers a top notch product that is easy to sell you should consider this fundraiser. Lollipop fundraisers are a no brainer for so many groups. Most of our lollipops sell for $.50 so they are very affordable. You make 50% profit. There's only a one case minimum and shipping is FREE. We provide fundraising products and easy fundraising ideas for non profit organizations. When you start a fundraiser with us, you are supported from start to finish with a personal fundraising consultant. Shop with confidence! Groups nationwide choose us year after year for our quality of service and extended, no-money up front payment plans. We strongly believe product fundraising offers schools, sports and church groups a unique opportunity to raise money making high profits selling products people are accustomed to purchasing to support a fundraising effort. However we also know that product fundraising is not the only option out there. We want to be viewed as a top resource for all fundraising ideas so we want to offer some fundraisers that do no require any product sales as well. 1. One of the best new fundraisers for elementary and middle schools that we've seen in a long time is an old-fashioned read-a-thon but done digitally. We suggest you consider the Read-a-thon Fundraising Company. 2. Simply ask for donations. You can do that with your own campaign or you can use a company like GoFundMe or Rally. 3. Car Washes are also a good way to raise money. You'll need a good location and lots of promotional activitiy. And you will need lots of volunteers. 4. Partnering with local restaurants is also a great fundraising idea. Many local restaurants will gladly share some of the revenue brought in on a specific night if you agree to heavily promote the event. The restaurant is obviously looking for increased sales so your group would have to be large enough for them to justify participation. 5. Raffles are another great way to raise money, especially for larger groups. It helps if you can get a company or individual to donate an attractive prize that makes people more likely to purchase multiple tickets. We hope you will think about Fast Track Fundraising each and every time you need to raise money. We are always here to help you make the best decision for your group. Smencils Fundraiser : Smencils Rock! Call us toll free at 1-888-778-2580 or email us at . We're here 24/7 to help you reach your fundraising goals!